Saudi Arabia, April 1, 2017: Suppliers of the world’s most sought-after stone have targeted the booming Saudi construction industry as a major market for expansion in the next six years. Quarry owners from Turkey – renowned internationally for their vast supply of exceptional natural stone and marble – have touched down in the Kingdom ahead of the first Stone & Surface Saudi Arabia trade show, starting in Jeddah on Tuesday evening. Home to more than 80 types of stone incorporating 400 different colours and patterns, Turkey is firmly established as the world’s leading nation for stone supply. Its biggest international suppliers – currently responsible for US$1.8bn of exports a year – are aiming to promote the use of their distinguished stone to those behind Saudi’s 4,000 ongoing construction projects, valued by market surveyors BNC at almost US$730billion. With a national stone export target of US$6billion by 2023, Turkey’s leading stone providers view their own bold targets as being reflective of Saudi Vision 2030 – and head to the Kingdom with the intention of doing business with the region’s biggest construction firms this week. They will showcase their products across the next three days – April 4-6 – at Stone & Surface Saudi, which is inviting the region’s construction and design industry to liaise with big name Turkish firms including Eymer, Onur Madenclilik, Yeditepe, and a host of international suppliers from the likes of China, UAE, Italy, Oman, Belgium, Lebanon, Germany, Australia and Saudi too. Cemal Erdal Batibay from TMG Dogaltas said: “The Saudi market is very attractive for our products. We have seen an increasing sales trend from the second half of 2016 until now across Saudi. Umran Keser from ERK Marble said: “We are participating in Stone & Surface Saudi because we want to change our main market. Other international industry suppliers will be joining the Turkish pool in exhibiting at this week’s show, excited by the promise the Kingdom offers as it aims to become the leading Arab nation through the Government-led Saudi Vision 2030. 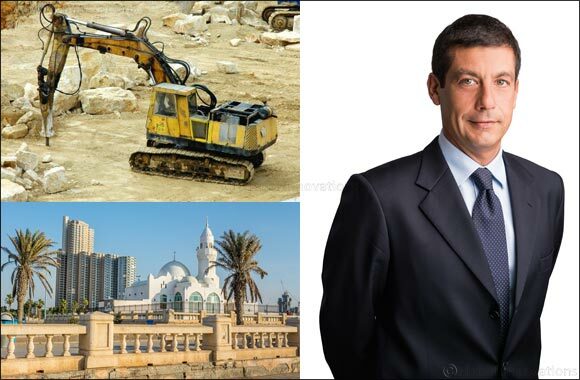 Stefano Iannacone, Regional Managing Director at Dubai-based Mapei Construction Chemicals LLC, said: “This past year has been quite fruitful for MAPEI and we have quite a few innovations to share with other players in the market. We are proud to present a selection of solutions with waterproofing, installations and renovations, for surfaces which involve ceramics, porcelain tiles, concrete and mosaics, to name a few. “We like to think that there was never a ‘bad time’ to do business in Saudi Arabia. Ever since 2016, MAPEI has been focused on increasing its presence within the KSA market due to both its size and enormous potential. Despite what would have been described as ‘a challenging economic climate’, the country remains one of the best performing and promising markets in the region. Organised by MICE Arabia and co-organised by dmg events, Stone & Surface Saudi takes place at the Jeddah Centre for Forums and Events from April 4 to 6. Its aim is to facilitate the procurement of the stone, marble and contract flooring provided by both domestic and international suppliers to the Saudi-based designers, architects and project managers responsible for the Kingdom’s huge ongoing construction projects, showcasing varied options for contract flooring, wall covering solutions, natural stone and ceramics.